In basketball, hockey, and lacrosse, you can read up on stats for an “assist;” credit going to the one person responsible for passing the ball to the scorer. It’s a sports statistic for a reason—because it matters. In rugby however, this statistic doesn’t even exist. How is that possible? Because most tries are created by multiple assists, sometimes a continuous series of assists that can go on for a several-minute period before the try is eventually scored. Try Scorer: Okay, credit where credit is due, Takudzwa (Zee) Ngwenya, the Try Scorer, finished off the play with exceptional skills, footwork, and pace. (He actually ended up landing a contract in Europe off the back of his efforts and still plays professionally in France). Pure talent for sure, but let’s back up a bit and walk through the Try Makers involved—all of whom I had the genuine honor of playing alongside during my international career with the USA between 2003-2005…back when I was younger and fitter, of course! Leader # 1: Todd Clever, appropriately enough, the current USA National Team Captain, intercepts the ball against the odds on USA’s own goal line and aggressively advances the ball forward. He exhibits confidence and commitment to his decision. When faced with a barrier ahead, he assesses his options & forces it out of the way. However, he knows he can’t make it all the way on his own, so immediately looks for a teammate to take the ball forward from here, and assist’s the ball off to Alec Parker. Off the field, Todd is the equivalent: An entrepreneur that seized an opportunity, created a movement, and made it happen. Try Maker #2: Alec Parker, who managed to notch up over 50 appearances for the USA was dubbed by his former teammate and then coach, Tom Billups, in 2007 as “One Hard Man.” Having played with and against Alec, let’s just say, I concur! He was one of the best “Try Makers” out there—and scored a few along the way, too—by doing the hard work. In this video Alec worked hard to get there and support Todd, trusting Todd to make the right decision (to pass). Alec then advances the ball forward himself before providing the glue to success of the whole play. Rather than choosing to take unnecessary contact and make a few extra yards, Alec selflessly passes on the ball to ‘assist’ Mike Hercus to take it from here. Try Maker #3: Mike Hercus was the USA’s primary play-maker in 2007. In the clip he takes the assist from Alex, continues to go forward, but using his lightening quick reactions and peripheral vision, identifies an opportunity out wide. He immediately makes a long, well-executed lateral pass to assist (the 3rd assist so far in this Try in case you lost count) his teammate, and Try-Scorer, Zee. Zee works his magic and the rest, as they say, is history. So, while Zee exhibited incredible skills, this try would not have been made possible without each of the player’s contributions to the try. This was a break-away try after a turnover, but many tries are the result of the entire team grafting and pulling together over a longer series of play. 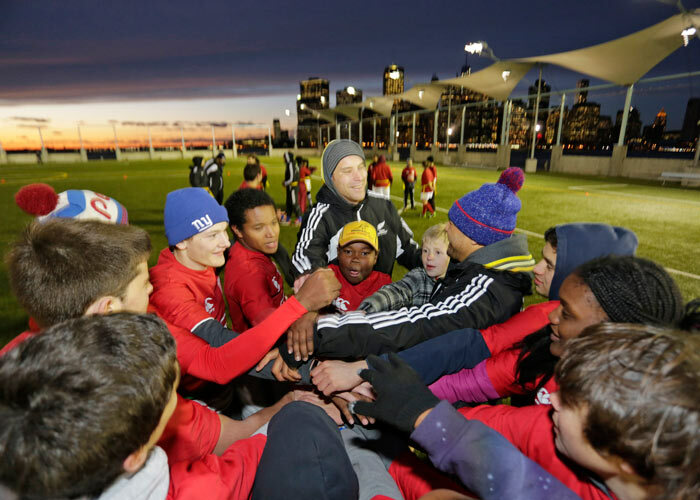 In rugby, there is a role and a need for everyone; the best international team in the world, the New Zealand All Blacks, summarize this as “the team towers above the individual.” What other sports have a foundation as such? 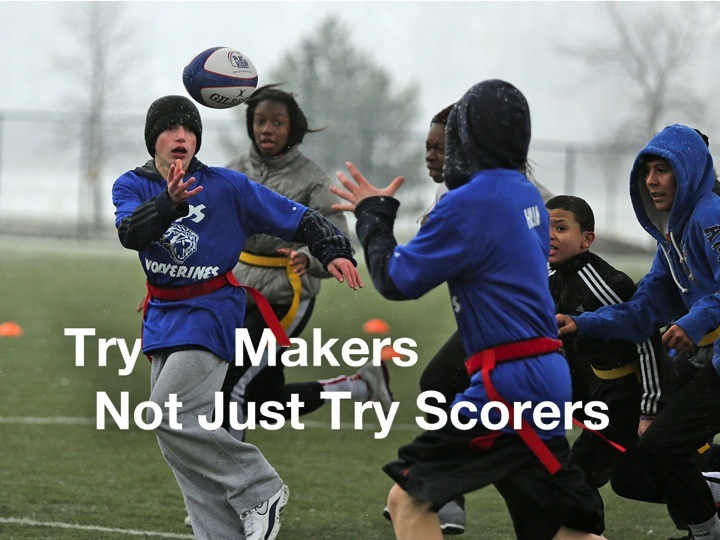 So, what are the learning points from this off the field in order to achieve success as Try Makers, not just Try Scorers? 1) To be successful you need both leaders and supporters. 2) For an opportunity to be “game-changing,” leaders may have to react quickly, take initiative, and drive it forward, against the odds. 3) When the odds are stacked against you, you can’t, and thankfully don’t have to, make it alone. 4) Teamwork and support is vital to be successful, so you need an effectively balanced team. 5) The best teams put “Team First, Self Last.” Personal sacrifice if necessary to benefit the team. 6) The best teams trust each other and work hard together. 7) From trust and hard work comes camaraderie and success.